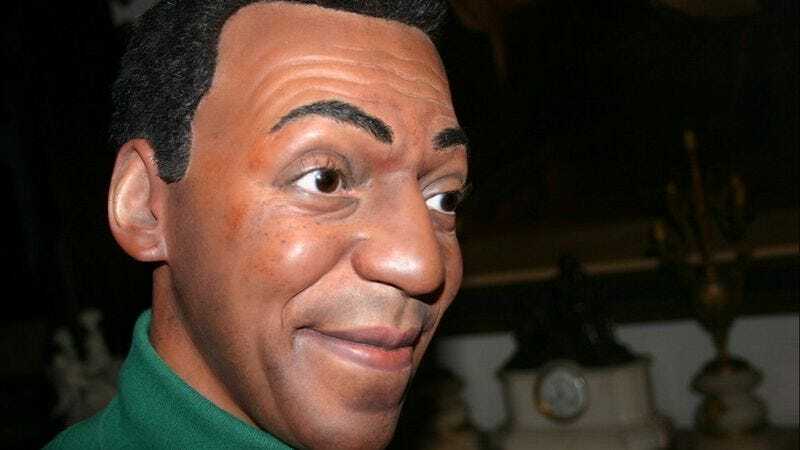 Anyone want this $9,500 life-size wax replica of Bill Cosby from Belgium? One of the clearest signs that a dictator’s reign has come to an end is when statues of him are removed from public display. It happened to Stalin. It happened to Saddam Hussein. And now it has happened to Bill Cosby. The last year has been a disheartening one for the 78-year-old comedian, formerly America’s ideal sitcom dad, bottoming out with his recent arraignment on a sexual assault charge. Barring a series of miracles, Cosby’s reputation seems to be beyond repair. What to do with the tokens of his former glory? An intensely creepy wax effigy of the erstwhile Heathcliff Huxtable has found its way to eBay, supposedly emanating from a wax museum in Belgium. The “Buy It Now” price is a mere $9,500 (no refunds), and the figure comes complete with Cosby’s signature green turtleneck and plaid pants ensemble, along with some brushy-looking hair that might well have come from a wax version of Tom Hanks as Forrest Gump. The seller’s description offers some additional insight, while simultaneously raising further questions. This is a very fine and rare Bill Cosby life wax mannequin with the portrait painted wax head, with a hand plunged hair, and glass eyes, on a fiberglass body, dressed in Golf attire and brown leather golf shoes, approx. 67” height standing on a metal base, with beautiful detail and excellent condition all around, the piece was sold through a Hollywood museum, located at Hasselt City of Belgium. While there is such a museum in Hasselt, the Bill Cosby statue is actually being sold by a Beverly Hills antique dealer. That should help ease the shipping costs. Unsurprisingly, this showbiz grotesquerie was discovered by “America’s $1 funnyman,” comedian Neil Hamburger, who enthusiastically shared it with his vans via Twitter.